Intensity is one indicator of amplitude. Intensity is the energy transmitted over a unit of area each second. The unit of intensity is the decibel (symbol: dB). Table 10.3: Examples of sound intensities. 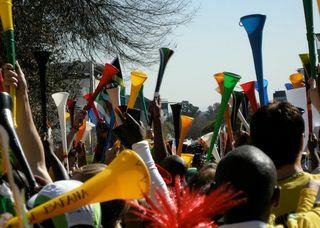 Vuvuzelas feature prominently at soccer events in South Africa. The intensity of the sound from a vuvuzela depends on how close you are. In Table 10.4 you can see how the intensity differs.